I'm trying to hold myself accountable to finish some of the projects on my to do list by posting each Friday about a project I've completed. For the most part these projects aren't part of my daily or weekly household chores, although some weeks finishing those items is a challenge all in its own. We've been eating whole wheat tortillas for lunch every day for a couple of years now. It may sound boring (and it is sometimes) but we have the same exact lunch every. single. day. It sure does make meal planning and preparing a lot easier, though. Our lunch consists of whole wheat wraps or tortillas rolled up around peanut butter and half a banana (sliced lengthwise). We also have an assortment of raw veggies and the occasional fruit. Since we've been eating like this for so long, our kids don't know any different and never really complain. However, since we moved I've been looking for healthy (real ingredient) whole wheat tortillas and I haven't been able to find any. Finding whole wheat really isn't a problem, but all of the ingredient lists have been at least 15 items long and contain words I can't pronounce, not really that good if you're trying to eat a real food diet. So, I started searching for a whole wheat tortilla recipe and I'm so glad we decided to try making our own. We used the recipe for Soaked Whole Wheat Tortillas from Stephanie at Keeper of the Home. Not only are they healthier (only 5 ingredients...and I can pronounce all of them) but they are also much less expensive than the less healthy store varieties. Even if we were able to find real food tortillas, this recipe would be a more frugal option. What things have you crossed off of your list recently? I love, my cousin, Sarah's monthly photos of her son Peter. I'm going to try to stay on the ball and do a monthly photo of Amelia until she turns one. I decided to choose a 12 month onesie so she can wear the same clothes in every photo. Here are two I took today. I can't decide which I like better. 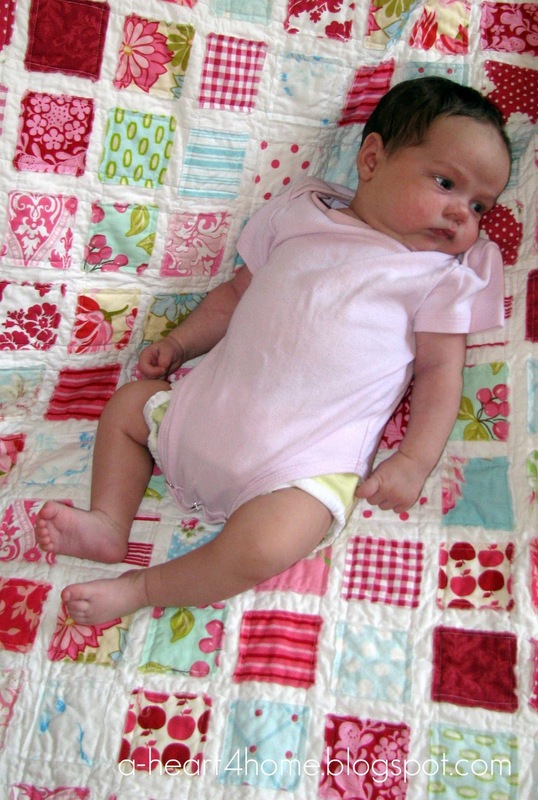 What do you think, should we stick with the plain background or the colorful baby quilt? 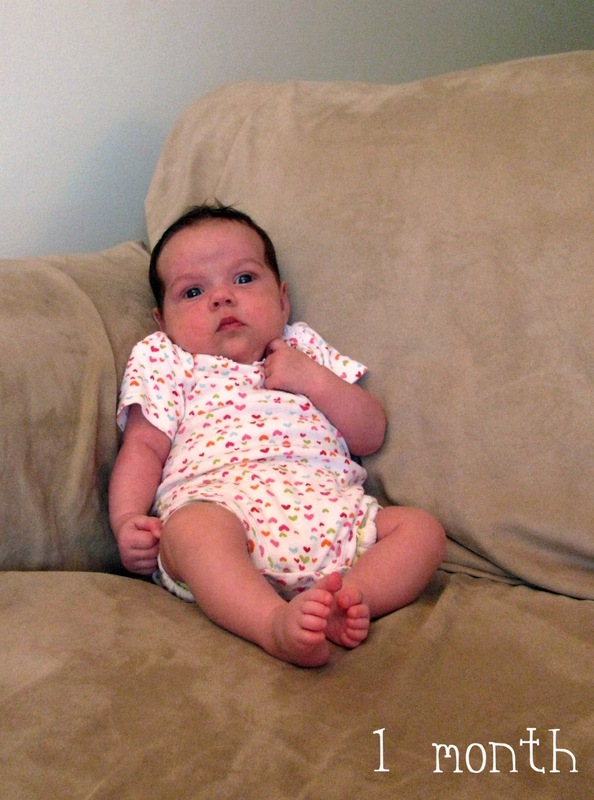 Also, any tips for photographing a baby indoors with only a point and shoot camera? Flash, no flash? This past week we received this gorgeous quilt from my aunt. 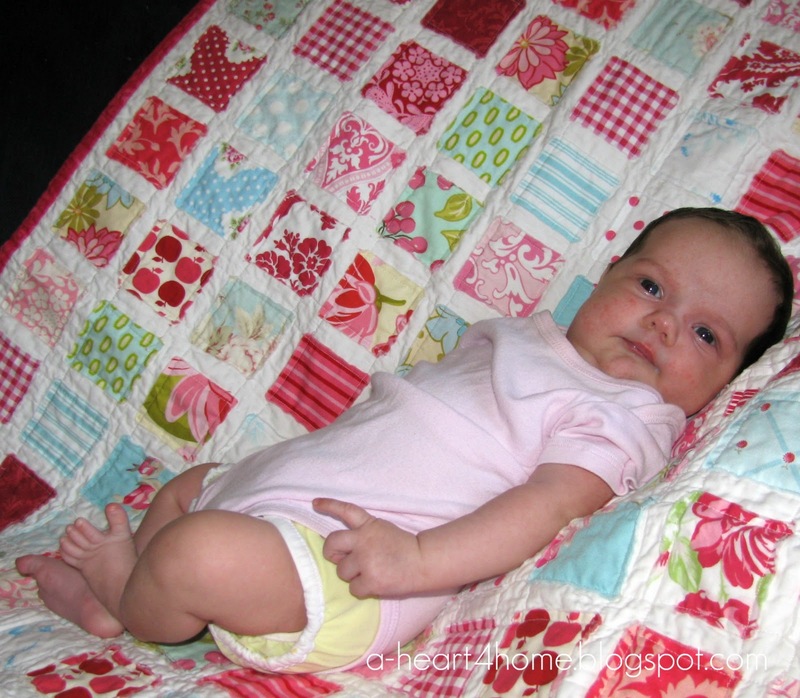 She has lovingly made each of our four children a quilt when they were born. That means she's made four baby quilt in the last four and a half years, and that's just for our family alone. I'm so glad she's shared her special talent with us. I'm sure if I was left to myself to make a keepsake quilt for every child I'd have them finished...well, maybe never. 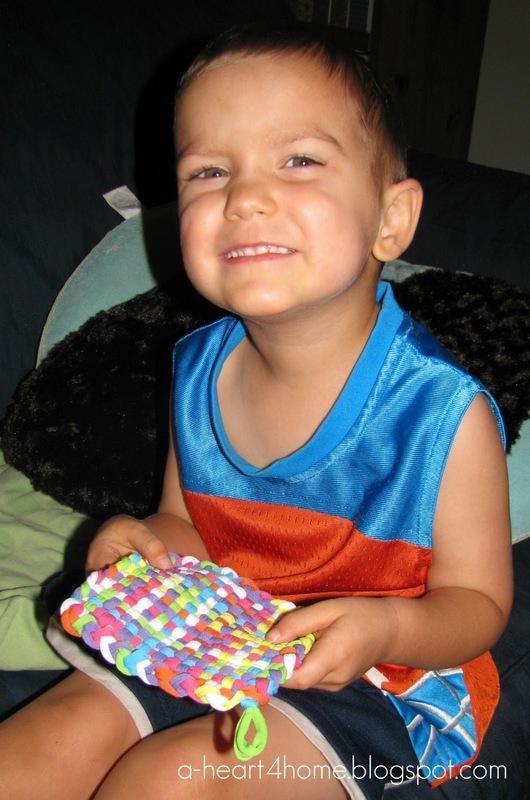 Do you make or purchase special keepsake items for each of your children? If so, what? Happy Birthday to our rough and tumble sweet cuddling boy! :: I really needed this reminder this past week: The Ripple Effect of One Grumpy Woman. 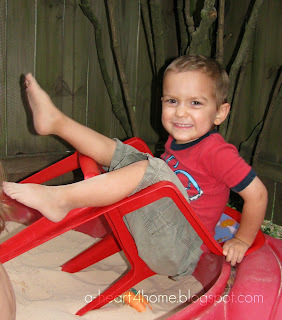 :: I love these ideas for Simply Toddler Learning Activities. Stephanie even included a free pdf document with all the materials and activities spelled out! :: I got a little chuckle from this list of 7 Benefits of Breastfeeding. 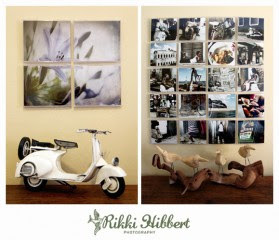 :: DIY Recycled CD Cover Frames. Too bad I just got rid of a stack of these. 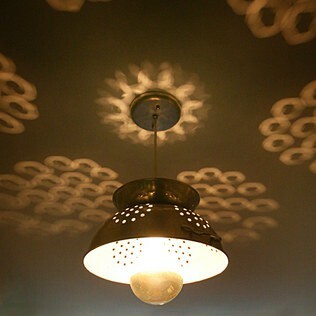 :: This Colander Lamp. Here's a DIY version. 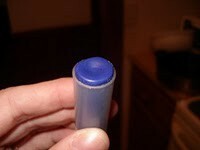 :: This DIY Crayon Glue Stick. This is such a great way to recycle old crayons and give then new life. Linking up to Simply Staci's Saturday Stumbles. Have you come across any good reads this week? We'd love for you to leave a link in our comments section. In our bedroom closet there is a plastic tote already filled to the brim with Christmas gifts. Lots of these gifts are items we've purchased on clearance or at yard sales (many new items) already this year. However, we still have a lot of gifts to go since we have quite a few names left on our Christmas list. Unless we find a great item at a remarkable price we generally make most of the gifts we give. Not only do I thoroughly enjoy crafting, but I can usually make gifts for less than we can buy them for as long as I use some creativity in choosing a gift and materials. This year, Tim and I decided to let the kids make a lot of the gifts for their grandparents. This past week, Emahry and Jonathan made the very first one as part of their preschool workboxes. I know these loom pot holders have been around forever, in fact I have a couple I made as a child, but the kids loved making it. It was also a completely free way for the kids to craft for their grandparents since the kit itself was a gift. One down...oh, so many left to do. There are still a limited number of $50 Abe's Market vouchers available for only $25. If you're new to Eversave you'll receive a $3 credit upon sign up making this deal only $22. Abe's Market has a flat shipping rate of $3.99 on order under $49. Order over $49 ship for free. Code cannot be used towards shipping. Abe's Market has a huge variety of all-natural and organic products for the home as well as food, beauty products and lots of products for babies and kids. This week we're discussing how we involve the entire family in our homeschooling journeys. In our household there are two main homeschool "extras" who we try to involve. The first is my husband, Tim. The second group of "extras" are our two youngest, Eliya (19 months) and Amelia (4 weeks). Right now Tim is working nights. He leaves for work between 3:30 and 5:30 and returns home between 1 AM and 3 AM most mornings. (Typically he comes to bed another 30 minutes later after unwinding a little. Then he wonderfully takes over taking care of the older three kids, of which the younger two still wake up throughout the night for bathroom breaks or from teething pain.) Needless to say, around 7 AM, when we all get up, he is still very tired. So after a night of working we try to let Daddy sleep in. Tim usually wakes up on his own around 10 AM. Since we start school a little after breakfast, Tim usually sleeps through our school day, but there are lots of other ways he is involved. ~ He's my best supporter. Tim fully supports our decision to homeschool. He loves that our children will be with us throughout the day. On days when I feel like they didn't learn a thing and my patience is at it's end he reminds me that letters and numbers aren't the most important things that I'm teaching. He helps me to focus on teaching their hearts and simply enjoying being together. ~ He's my most realistic sounding board. While other people might think ideas sound good, Tim understands our family the best and knows whether my sometimes unrealistic ideas will actually work. I love being able to bounce ideas off of Tim. ~ He encourages the kids by being excited about what they are learning. Tim loves seeing what the kids have learned and boy do they love showing him. Sometimes they just "can't wait" for Daddy to get up so they can show him their work from that day's lessons. ~ He is also a teacher. Even though Tim isn't awake when we "do school" we have to remember that all of life is schooling. Tim takes the kids outside to play and teaches them how to climb a tree, kick a soccer ball, grow sugar snap peas, build a "farm fence" out of twigs...all things that would not fit into our morning lessons. On rainy days or just plain lazy days, he breaks out a fun game and the kids learn more about taking turns, practice counting, and learn how to be a good winner and a good loser. The other people we involve in our homeschooling on a consistent basis are our two youngest children, Eliya and Amelia. Eliya joins us for school time every day and Amelia joins us when she is awake (about half the time). While Eliya definitely isn't ready to learn a lot of what I'm teaching to Emahry, Jonathan isn't technically ready either. So my goal for this year at least is to focus my teaching on Emahry while finding ways to incorporate the younger children in meaningful ways. For Eliya this typically means that she is sitting with us and helping by passing out materials or practicing fine motor skills with some of our materials. We also try to involve everyone with art activities (many found at Pink & Green Mama). I've also found lots of art ideas on Pinterest. As for the baby, she simply sits with us or watching from close by when she is awake. She's even been known to nurse straight through a lesson without a hitch. As homeschoolers, we also have to remember that we have a lot more resources to draw from than we often remember. Everyone you know has some sort of skill and their abilities are most likely different from your own. So we try to take advantage of the ways that God has made us all unique in order to teach our children things that they may never be able to learn from us alone. Just last week, Tim took the three older kids to visit his dad at work. Grandpa works at the airport and is in charge of all of the airplane mechanics, so the kids were able to see inside of an airplane. They even got to sit in the pilot's seat and "fly" the plane! The kids are also excited to visit my brother's new coffee shop when it opens in a few weeks. Emahry says see want to see how doughnuts are made, which is something I don't have time to do right now, so instead Uncle Nate will be showing her how he makes doughnuts in a real coffee shop kitchen. Who do you involve in your homeschooling? What are some things your children have learned from other people in their lives? Visit my fellow Tri-Moms, Kristin @ Bits and Pieces From My Life and Christy @ A Living Homeschool and read how they involve their whole family in the education process. 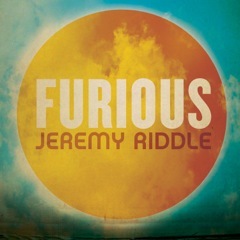 Vineyard Worship artist and worship leader Jeremy Riddle has announced the release of his new studio album entitled Furious. The album will be released this Tuesday, September 20 via NewDay Distribution. We almost passed on the opportunity we were given to review this new CD. Mostly because we didn't recognize the artist's name. I'm so thankful I took the time to listen to a few clips of his music. After listening to just two songs I knew we'd love the new CD. Jeremy describes Furious saying, “It’s hard to come up with words that depict the magnitude of Christ’s love – the depth and width of it. Furious doesn’t work outside of the context of love; we tend to translate the word as angry, but I see it as a super-powerful force; stronger, deeper, broader than our vocabulary can fully describe." Jeremy Riddle is a former Junior High youth minister and touring worship leader who is now serving as worship community pastor at Bethel Church in Redding, California. Tim and I have really enjoyed Jeremy Riddle's CD Furious. Jeremy's musical talent is clear but his songs also have the wonderful ability to help us contemplate the scope of God's goodness and prepare our hearts to worship God through our daily life tasks. Connect: Follow along with Vineyard Music on Facebook and Twitter. Like Vineyard Music on Facebook to download 3 FREE songs from his Live Prepare the Way album. Win It: We would like to offer one of you your very own copy of Jeremy Riddle's newest CD. 1. Preview Jeremy's newest CD, Furious, then come back and tell us which song you think you'd like the most. The giveaway will end Monday, September 26th at 11:59pm EST. We will pick the winner through random.org. :: We can completely relate to Stephanie's post, When Your House Is Like a Clown Car. :: Ann's words always touch my heart. The Bravest & Most Beautiful Affair is no exception. :: I'm also studying these 15 Tips for Buying Organic Real Food on a Budget as we no longer have the option of shopping at a healthy supermarket since we've moved. :: List of books to use with math. 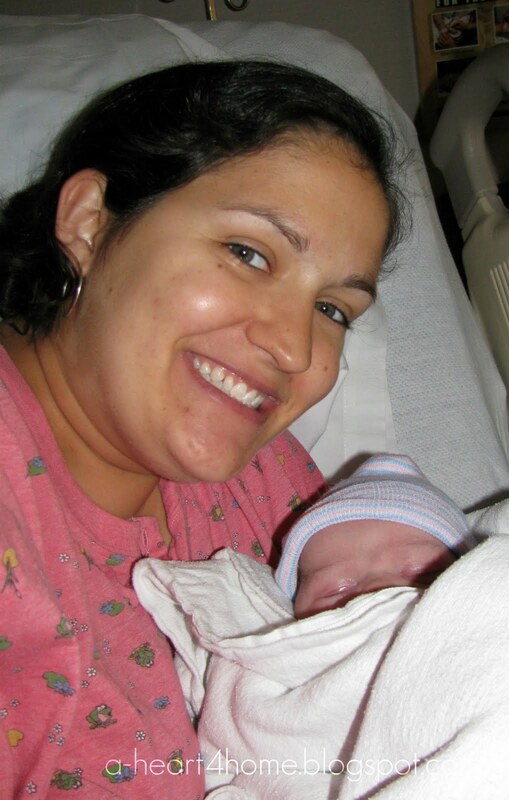 With our oldest three children, it took me a LONG time to get around to posting their birth stories. 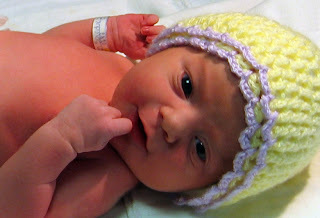 This time I was determined to get Amelia's entire birth story posted before she was a month old. 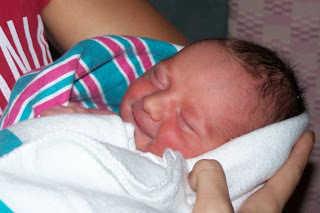 I just finished her birth story this week, so now all four birth stories are completed. Each of their stories are so different, proving that each pregnancy, labor and delivery is completely unique...just like each child. Want to read them? Here they are. Simply click on each link to begin reading. There are several posts in each story, so just follow the links at the end of each post to continue reading. Linking up to Finer Thing Friday. After a few contractions while half reclining on the bed, I noticed that though I seemed to be progressing my contractions were coming further apart. After a 6 minute span between two contractions, Tim and I decided that I should probably stand up to see if the contractions would speed up again. As soon as I was on my feet they started coming every other minute. At this point I knew I was fully dilated and felt as though each next contraction could push the baby out if the bag of water was not in the way. After a few of these contractions I managed to tell Tim I'd like for my water to be broken. Tim turned to Dana and asked if there was any reason not to break my water at this point. She said that she would do it if I wanted her to or I could simply wait for it to break on its own. At this point I knew that the baby would be born as soon as my water was broken so I told Dana I'd like for her to go ahead and break it. After the next contraction, Tim helped me back into the bed while Dana prepared for the immanent flow of bodily fluids. She then instructed me to let her know when I was ready. During the next contraction I told her to go ahead. It was now 2:48 PM. For a split second I felt an tremendous sense of relief. 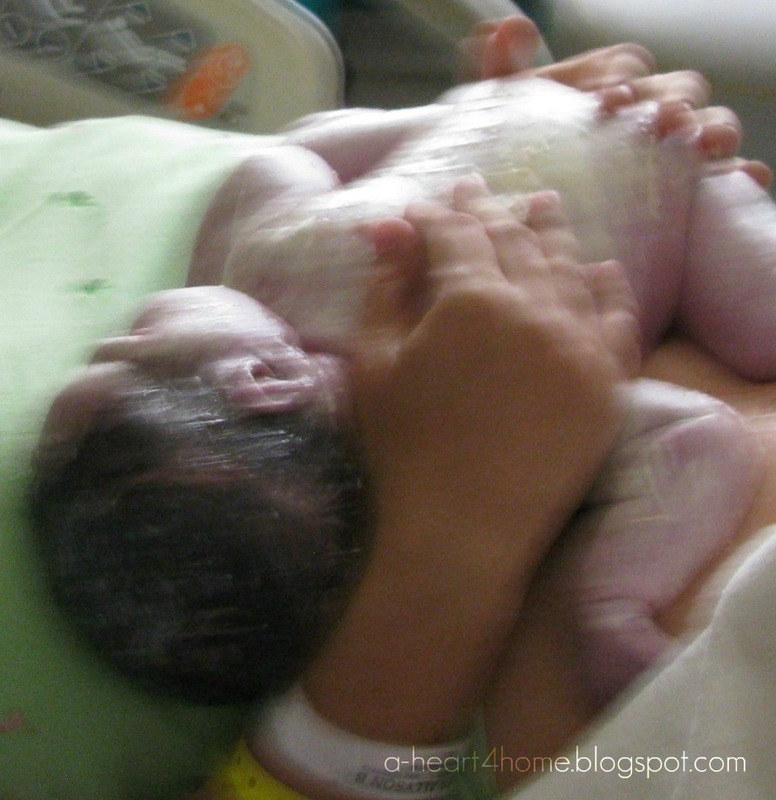 Then the next contraction was on top of me and I was rushed back to the reality of labor. At this point I told Tim that he needed to get ready to deliver Amelia and he put on his gloves. Unlike our other births, Tim was instructed to keep the gloves sterile by not touching anything after they were on. This meant that he could no longer touch me which I was not very thrilled about. I really wanted to hold his hand at this point, but there was nothing I could do about that. The next contraction hit and finally the urge to push accompanied it. The nurse offered me her hand to hold and I gladly accepted it. With my first push I could feel Amelia's foot pushing against my ribs and boy did it hurt! I told the nurse it felt like she wasn't too happy with me. With the next push, the nurse felt my stomach and said that it was indeed her little foot that was causing me so much discomfort. I'm not quite sure why a little foot in the rib hurt so much compared to actually pushing out a baby, but it did. 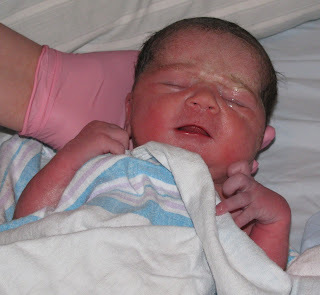 On the next contraction, Amelia's head emerged. Tim held her little face while Dana used her finger to check and make sure the cord wasn't around the baby's neck. I pushed one more time during that contraction and nothing happened. At this point I knew Amelia was bigger than our other babies. All of the other kids have been so small that after the head emerged the rest of them basically fell out, but not this time. Amelia was completely quiet and I actually started to worry and kept asking if the baby was okay. Dana assured me she was but that I would just need to get the rest of her out before she would cry. Because of my position on the bed, my contraction had once again slowed down a little and as much as I wanted to push her out it was as though my body was incapable of pushing until the next contraction hit. 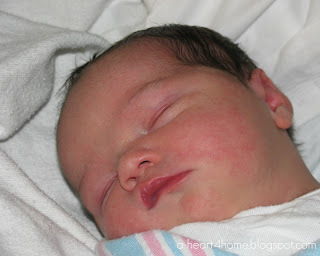 As soon as it did I pushed twice as Tim carefully maneuvered Amelia's shoulders out and our beautiful baby girl slid into her Daddy's hands. It was 2:56 PM, barely 5 hours after my first mild contraction. After admiring his newest little girl for a few seconds, Tim handed her to me. 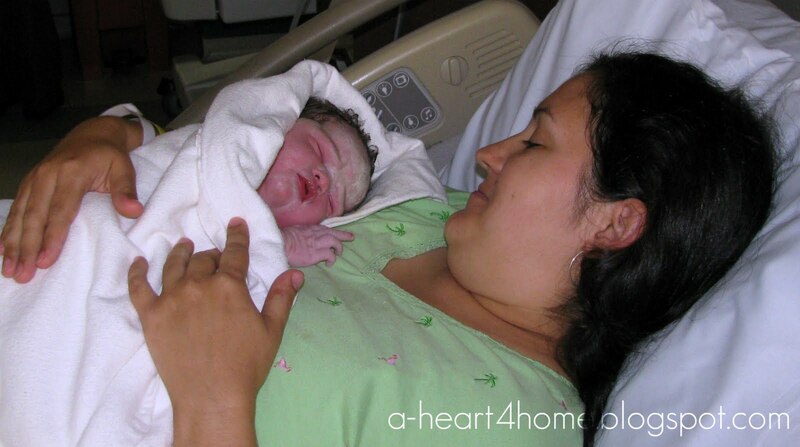 She was absolutely beautiful and was covered in vernix (a lot more than I would have thought for a 40+ weeker), definitely another little cheese ball like Eliya. 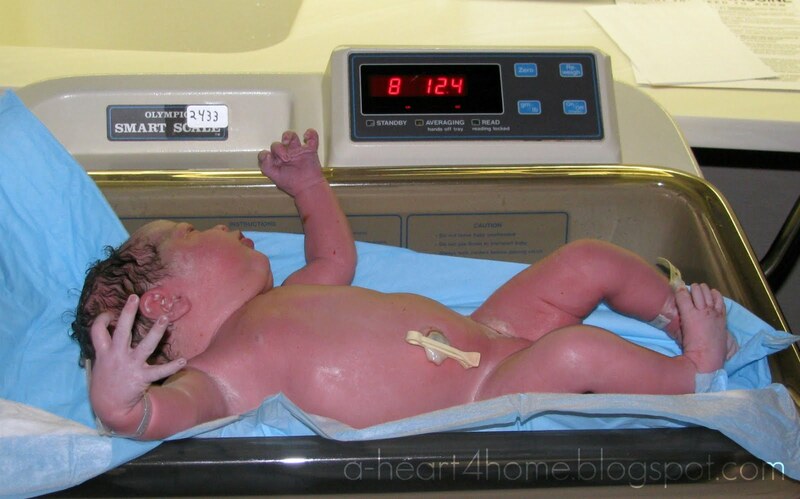 And definitely our biggest baby so far weighing in at 8 pounds 12 ounces. That's almost 2 pounds more than Emahry who was our previous biggest baby and almost 4 pounds bigger than Jonathan who is our smallest baby so far. She couldn't be more perfect! 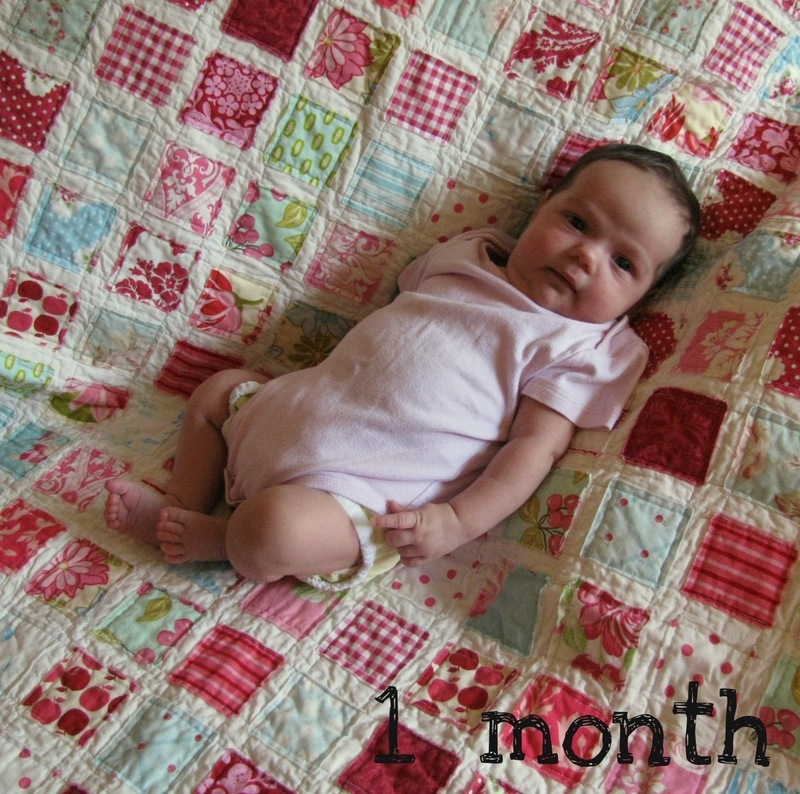 Here are some pictures of Amelia at 2 weeks old. I might be a little bias, but I think she is absolutely the definition of cuteness! ...you may also want to read Emahry's, Jonathan's, and Eliya's birth stories. They are all so different, proving that each pregnancy, labor and delivery is completely unique...just like each child. I love listening to music. I find that it makes the days run much smoother, so when I was offered the chance to review Ginny Owens' new CD, Get In I'm Driving, I jumped at the opportunity. While I've listened to her music before, it's been a little while and I've never owned one of her CD's until now. Each time I listen to her newest CD I like it even more. One song in particular has really touched me with the recent birth of our fourth child. Joined at the Heart is a beautifully sweet slow song. You are flesh and bone and beautiful design/ The Father's pride and joy before the dawn of time/ What is happening here?/ So mysterious/ Were we meant to be your refuge?/ Or were you sent to rescue us.../ We are humbled to be part of a greater story/ written by the author of miracles and stars/ And as this journey unfolds/ there is one thing that we know/ God has made it so we are forever joined at the heart. Here's some more information about Ginny Owens, her story is really incredible! A three-time Dove Award winner, including the Gospel Music Association’s 2000 New Artist of the Year recipient, and multiple ASCAP Award winner, Ginny Owens has sold nearly one million albums. A top performer on the Christian radio charts with hits like “If You Want Me To,” “Free” and “I Wanna Be Moved,” among others, Owens’ music has impacted mainstream audiences at Lilith Fair, the Sundance Film Festival and the White House. Her music has received widespread film and television placement, including songs on the popular WB series’ “Roswell” and “Felicity.” Owens was featured on national television, including NBC’s “Today” and CNN, for her contribution to help rebuild New Orleans following Hurricane Katrina. Born and raised in Jackson, Miss., Owens was discovering melodies on the piano almost before she could complete a sentence. Songs began to emerge from her fingers as the vision began to leave her eyes and by the age of three. A degenerative eye condition left Owens completely blind. Despite her physical challenge, Owens pursued a music career. Songs provide a window into a world Owens can’t see and an outlet for her to express her thoughts and dreams. Owens’ unique musical style and inspirational lyrics continue to appeal to Christian and mainstream audiences alike. In 2005 Owens launched The Fingerprint Initiative, a hands-on, non-profit organization designed to “bring hope to the world, one project and one touch at a time.” The organization has partnered with and raised money for groups such as Compassion International, International Justice Mission and Habitat for Humanity. Connect: Follow along with Ginny Owens on Facebook and Twitter. Win It: We would like to offer one of you your very own copy of Ginny Owen's newest CD. 1. Visit Ginny Owens' website, then come back and tell us why you'd like to win this CD. The giveaway will end Thursday, September 22nd at 11:59pm EST. We will pick the winner through random.org. Theo, an animated student of Godʼs Word, lives in a cozy corner of a quaint English village, in the heart of the Cotswolds, and entertains two mice named Belfry and Luther. We had the chance to review the first DVD in the series, Theo: God's Love and we have the wonderful opportunity to offer two of our readers a copy as well. Both Emahry (4 years old) and Jonathan (almost 3) enjoyed the two episodes we received. Emahry said she like the music and how funny the mice were. I liked the spiritual truths that were presented without the silliness that goes along with a lot of children's DVDs. I also love that Theo Presents runs a Buy One, Give One campaign! For every Theo DVD purchased, Whitestone Media and Child Evangelism Fellowship® will send a child in need their very own copy of Theo. You can log onto TheoPresents.com after making your own purchase, and select the region of the world you'd like another copy of Theo to be sent. Theo Presents also offers a free app for iPhone and iPad and has a church curriculum available through LifeWay Christian Stores. Buy It: Theo Presents is available through their website and on Amazon. Win It: We would like to offer two of you your very own copy of the Theo: God's Love DVD. 1. Visit the Theo website, then come back and tell us why you'd like to win this DVD.